Gave a talk to the PSRF monthly meeting in the morning. Afterwards I went with Alice to the dock and brought up the cultch set F2 oysters to the hatchery. As there weren’t very many tile set oysters, I wanted to supplement the experiment with these. I put them in one of the setting tanks outside in static, ambient water. Alice and I built a little “house” for the chiller to protect it from the rain. We set up the chiller in the smaller section of the setting tank in order to cool down the water quicker. The chiller was set to 0degC and turned on at 10am. Water on the other side was at 11degC, a little cooler than ambient due to the air temperature overnight. For the controls, 250+/- 5 cultch set oysters from each population were placed in 180 micron silos hanging in the ambient temperature side of the tank. I put around 350 oysters in silos on the chilled side at 11:30am when the temperature was at 7degC. At 1:00pm the temperature was at 0degC and maintained that temperature all day. At 1:30PM I added some tiles to the control and chilled tanks. 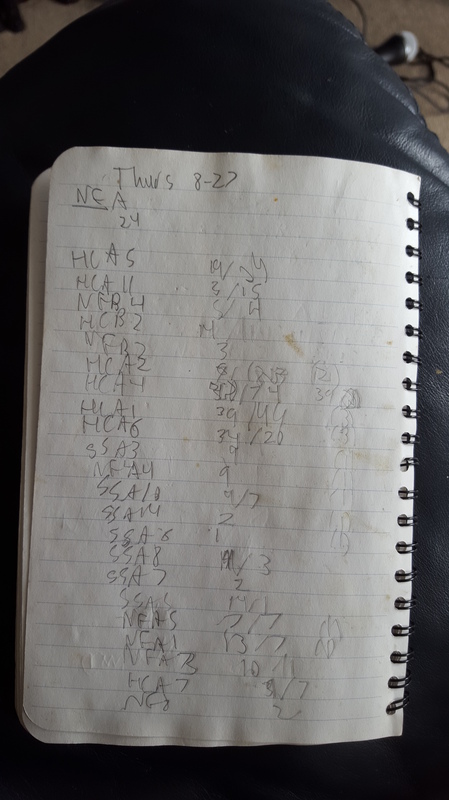 At 4:00pm I sorted out 200 cultch set oysters from the chilled tank and added them to new silos in the control tank labelled with the population name and “3 hr chilled”. In addition to looking for differential mortality, we are interested in looking at temperature-induced gene expression. I put some oysters from each group in small (300 mL) cups with chilled water and then dissected 6 from each population and put whole body tissue in 1.5 mL tubes with RNALater. This took about 45 minutes total but I tried to alternate between populations while dissecting. I took pictures of most dissected oysters with a ruler. At 5:00pm I brought in one tile for each population from the chilled tank and dissected 4 oysters per population, giving 10 samples each. These samples were placed in the fridge overnight. 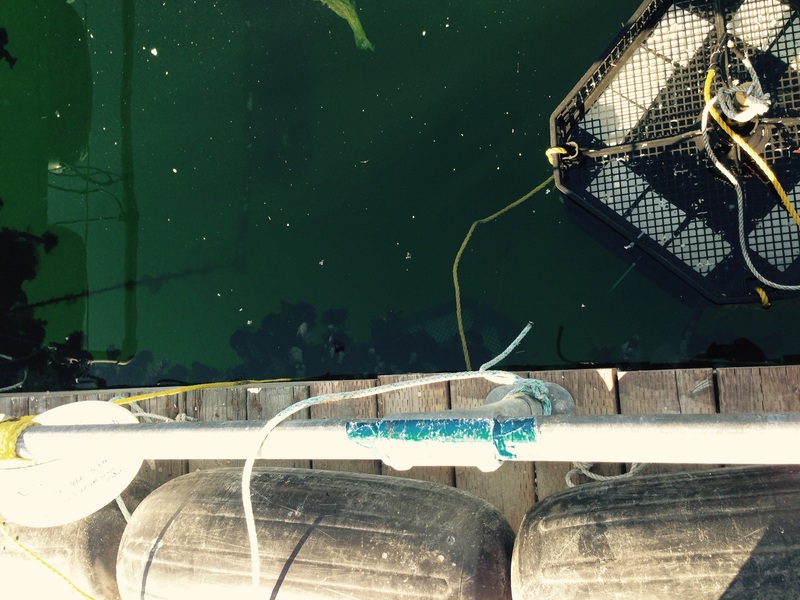 The other ~150 oysters in the chilled tank were left there overnight to be sampled the next day. – Chiller turned on and set to 0degC. Tuesday 11/3/15: Back in the Field! On Sunday 11/1/15 I took an early flight out to Seattle for a week of torturing oysters. 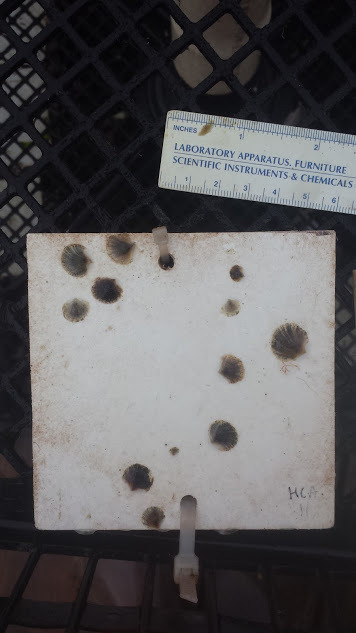 My goals for the week were to take pictures for size of my juvenile F2 oysters and do an experiment to test for differences in resilience to cold temperature shock. 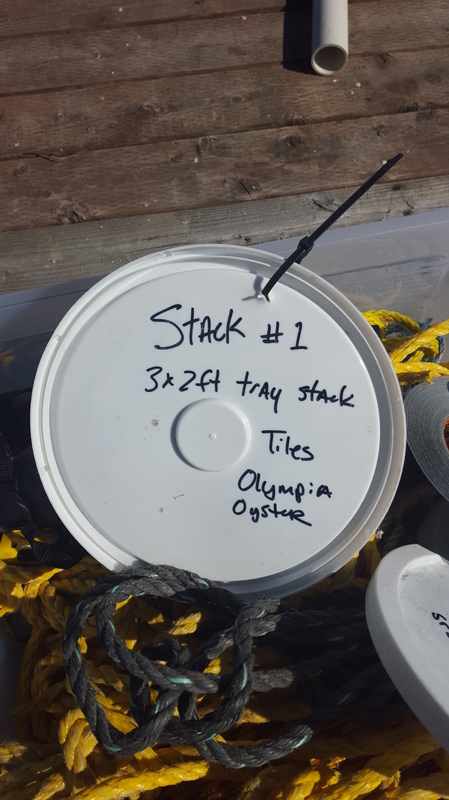 Over the summer I set juvenile Olympia oysters on PVC tiles and hung them off the dock by the Manchester Research Station at the end of the summer. Unfortunately, one of my stacks of trays fell off the dock a few days after during a crazy storm. They sat on the bottom for a couple of days and then were rescued by a crew that left them sitting on the dock in the hot afternoon sun. Once the hatchery crew realized where they were they quickly put them in a tank, but the stack may have been out of water for a few hours. They were redeployed on 9/10/15 with safety line and haven’t had an issue since. On 10/14/15 two of the PSRF hatchery crew, Stuart and Laura, pulled up the trays and photographed the tile to get size information. There was a lot of mortality on the stack that had been out of the water, but the other stack had good survival. Picture taken on 10/14/15 of a tile with Hood Canal juvenile oysters. Today I pulled up the trays and took pictures of the tiles. It’s exciting to see how much they had grown, even in just 3 weeks! I left the oyster tiles in a large, static tank at ambient temperature and splashed in some live algae. Alice and I also checked on some F2 oysters that were set on cultch at the end of the summer. These were basically leftover larvae after I had enough in my tanks with tiles. As larval production was really ramped down at the end of the summer, I suspect that these are from only a few individuals per population. To get a rough estimate of how many there were per population, I measured out 50 mL of oysters, counted them, and then measured the total volume of oysters. At 9:30am we turned on a chiller in one of the outdoor setting tanks and set it to 0degC. I monitored it throughout the day to see how long it took to get to 0. Steven Roberts came to help out today, which made the Wednesday cleaning/collecting larvae only take about 2.5 hours. 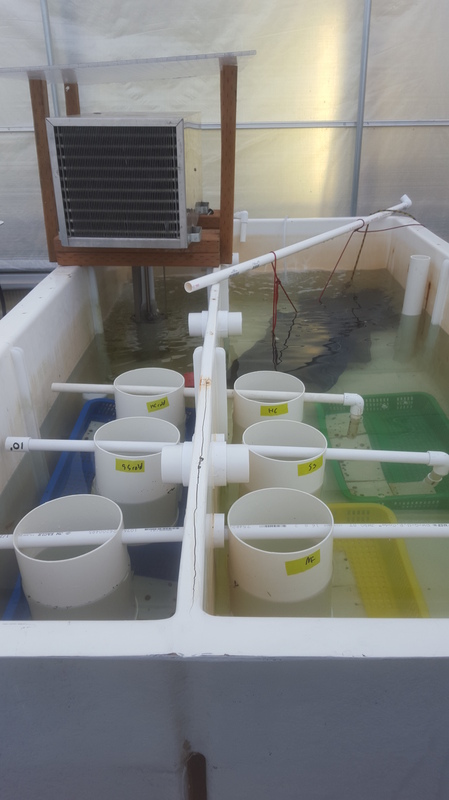 He did all of the larval counts, filtered out the SS larval catches, and cleaned many of the buckets. We decided in the interest of time to just qualitatively note individual family output of larvae and then combine the larval output from each family in a population for counting. SS5 seemed to release some sperm when put in the bucket with all the other SS families. I’ve organized my datasheet for larval counts a little differently. 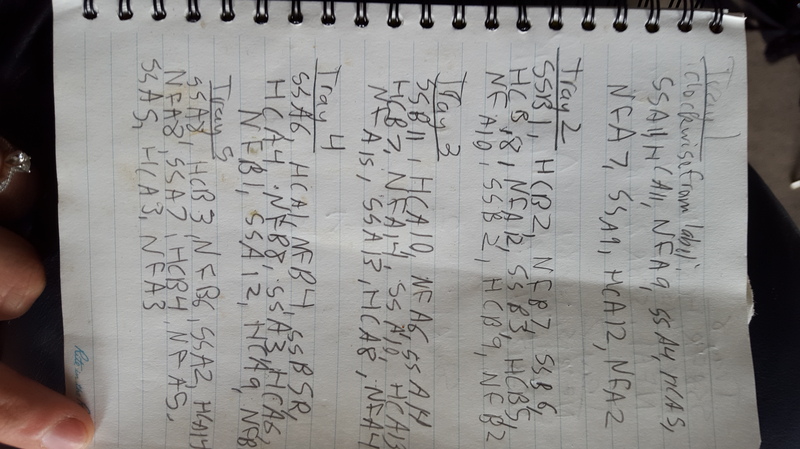 The 1st sheet, “Day 1”, is the raw data from counting the larval output from the broodstock. The 2nd sheet, “Larval tank counts”, is the raw data from counting the number of live/dead larvae filtered out of the 100 L larval tanks. It also lists the estimated ages of the cohorts in the tanks. 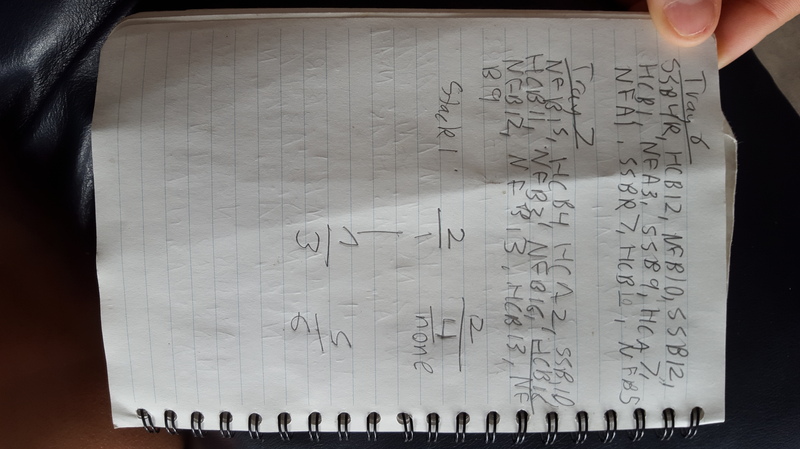 The 3rd sheet- “Larval tanks running total”- is formatted like a bank account transaction list, with larval tanks for each population the “accounts”. This incorporates data from the first 2 sheets to let me know approximately how many larvae I have in the 100 L tanks at a time. The differences between counts is also my estimated mortality (although some of this is due to leakage during cleaning). On Tuesday 6-23-15, the seawater was shut off for about 3 hours. Also, there was an issue with the airline so that tanks may not have been bubbling for a while. When I went in on Wednesday, all tanks seemed to be bubbling fine. Monday (June 8) was my first day out at the NOAA Manchester Research Station in Washington State. Specifically, I’m working in the Kenneth K. Chew Center for Shellfish Research and Restoration. This shellfish hatchery is the result of collaboration between many groups and funding agencies, in particular the Puget Sound Restoration Fund (PSRF). 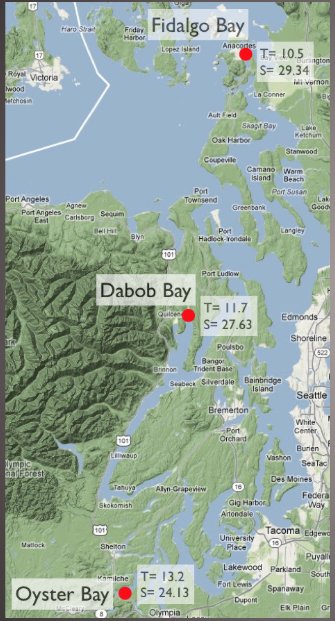 My project this summer is to raise oysters descended from three Puget Sound populations under common conditions in order to measure differences in fitness. 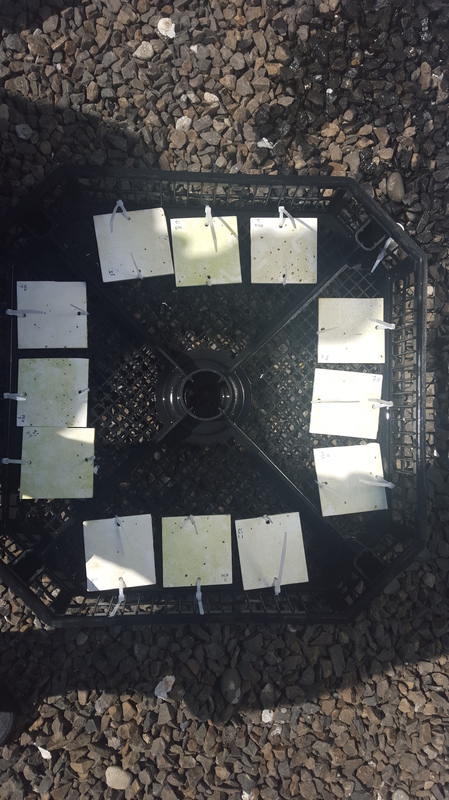 This type of experimental design is commonly referred to as a “common garden”, and allows one to control environmental variables so that phenotypic disparities among individuals can be attributed to their genetic differences. My fitness metrics are reproductive output, survivorship at different life stages, and growth rate. I will also be taking DNA/RNA samples along the way to see if mortality is random in respect to genotype, or due to purifying selection. With the RNA, I plan to look at differences in gene expression to help detect cryptic differences in phenotype between these populations. 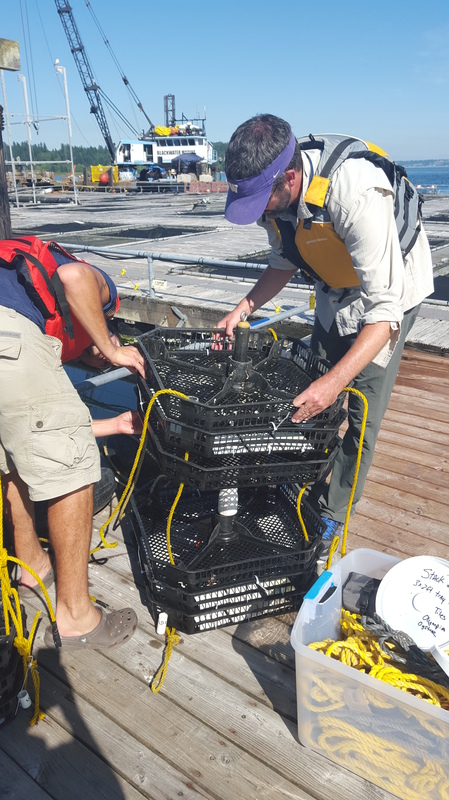 This project is a collaboration with Steven Robert’s lab at the University of Washington, who previously conducted a reciprocal transplant experiment with offspring of wild oysters from these same populations. 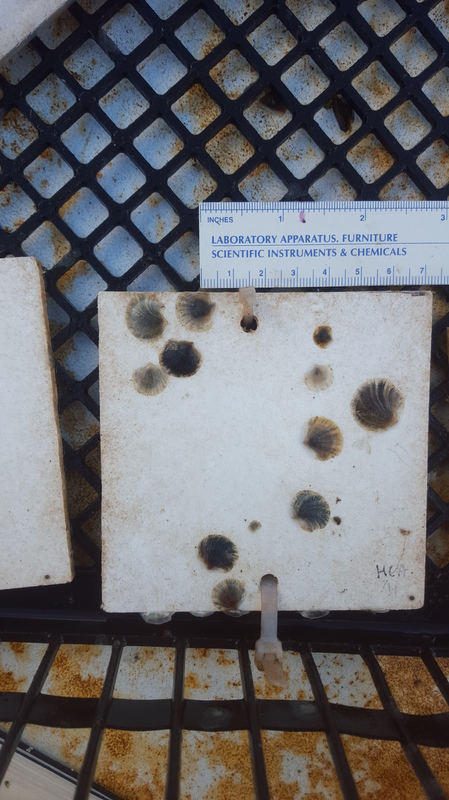 For that experiment, they outplanted the young oysters from each group at four different sites and measured growth rate, mortality, and reproductive characteristics. They observed significant variation at these metrics among populations and sites (informative slides and manuscript preprint available here). 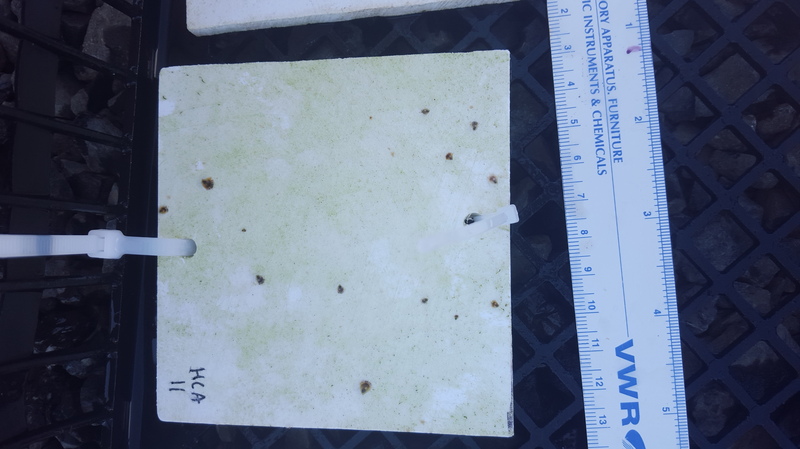 My experiment will be following up on these results by testing if population-level differences are consistent in a second generation under controlled environmental conditions. As I’ve never raised shellfish before, this week has had a bit of a learning curve. Fortunately for me, the staff at the hatchery have been super helpful in showing me the ropes and advising on how to set up my experiment. I’m starting with about 100 adult oysters for each group (see lab notebook entries for data). These are the first generation (F1) offspring of wild oysters, and have been living in common conditions their entire lives- mostly hanging off the docks near the hatchery. Their offspring will be 2nd generation (F2) from the original broodstock, and should have any influence from maternal effects erased. The adults were brought in to the hatchery on May 28 and placed in three separate buckets to avoid cross fertilization. 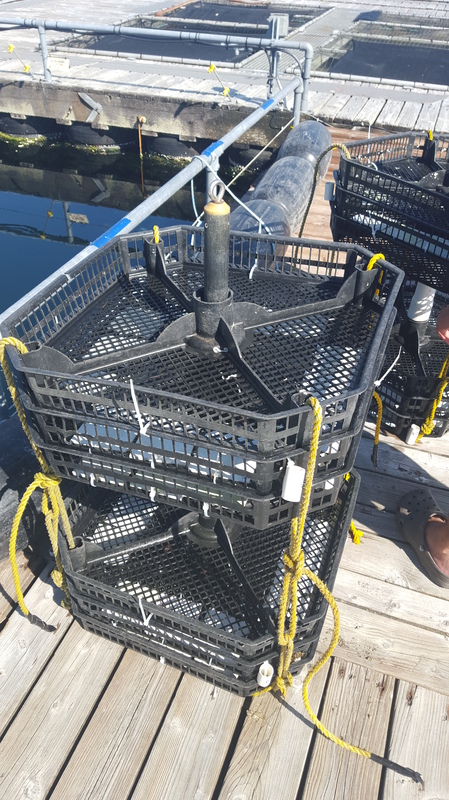 To maximize genetic diversity and minimize the chance that one male fertilizes all of the females, I split each group into 5 buckets of ~20 oysters. These “families” will be marked, so that I can genotype them later and follow their offspring’s success throughout the experiment. Their water temperature was switched to a balmy 20°C this week, which will encourage them to start spawning and producing larvae.